Enhance your bathroom décor with a quaint mason jar bathroom set that adds a hint of charm to the otherwise plain surroundings. Since the commercial ones are pricey, it would be the best option to go the DIY way for a lively bathroom space customized to fit your aesthetics. Add to it, the immense satisfaction you get after finishing a homemade project. 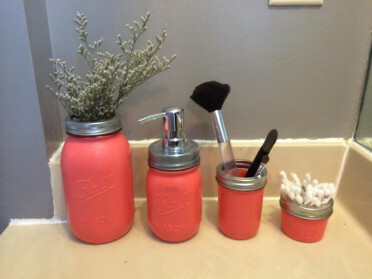 Always being a firm believer in the great capacity of mason jars to boost home décor, I designed my mason jar bathroom set after chancing upon a wonderful post in WILD WHISPER. First, clean all the jars with soap and water and let them dry completely before starting with the painting. 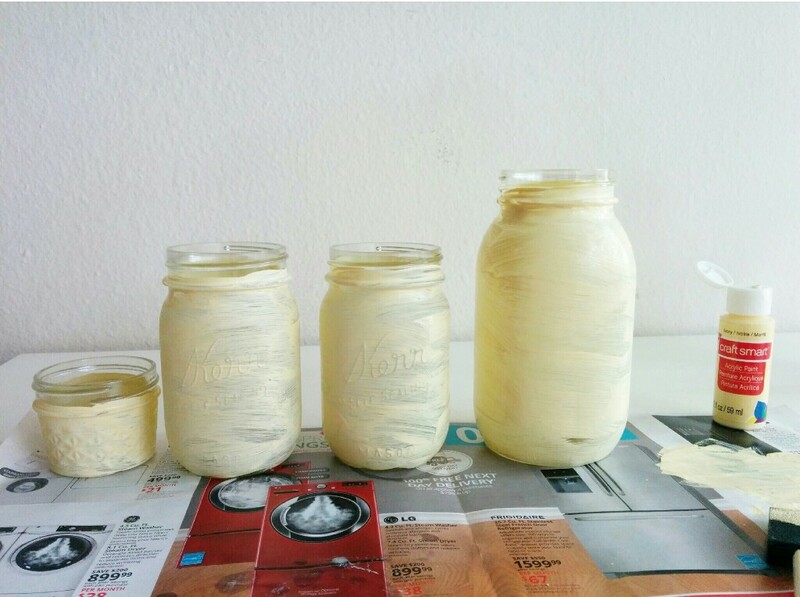 Take the jars one by one and give them 1 coat of craft paint over the newspapers that have been spread on a table. Ensure that you always paint in a single direction. Set them aside for 10-15 minutes until they dry completely. Similarly, paint a second and a third coat allowing the drying interval as mentioned above. 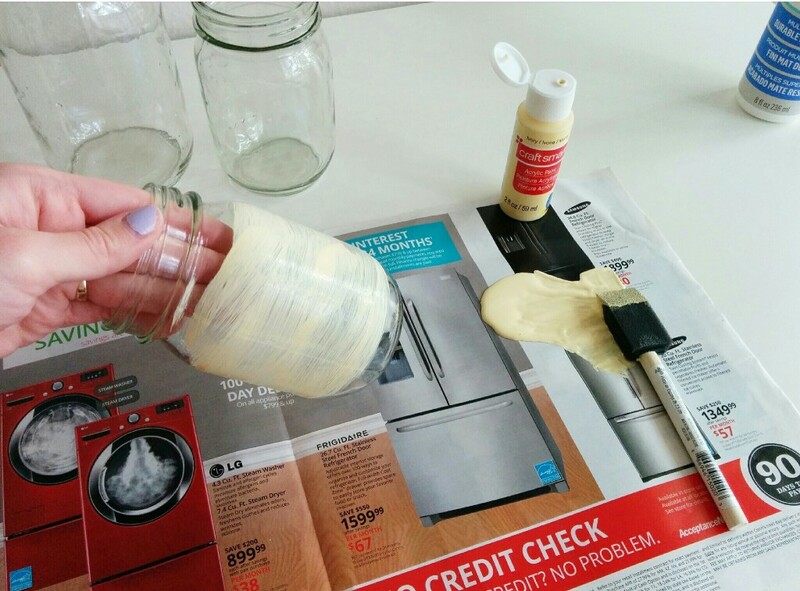 Pour a little of the top coat over the newspaper and start painting it on the jars. You should cover the entire painted area with it. After finishing with 1 layer on all the jars set them aside for drying that usually takes 2-3 hours. Repeat applying the top coat layer 2 more times allowing the necessary drying intervals. Once you are done, you need to let the jars sit for around 4-5 days before putting them in your bathroom. Screw the rims on the jars and you are ready. I put artificial flowers in the biggest jar and used the pint-sized jars for the toothbrushes and makeup brushes. Q-tips suit the tiny jelly jar. You can use another pint-sized mason jar for storing liquid soap. In that case, arrange for a soap dispenser lid that fits the jar. For a bathroom caddy, choose the mason jar sizes accordingly. 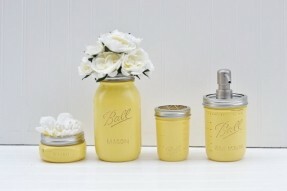 If you happen to own a vintage mason jar, housing your tissue in it would be a cool idea. In fact, it would be good to take various sizes of mason jars and place them in decreasing order of their heights. Painting in bright red or blue gives an excellent pop of color that attracts sleepy kids to visit them first thing in the morning. Have a great time with the easy steps of creating the bathroom set. Do let me know about your experience and the compliments you received. Well for me, whenever my in-laws or my friends come for a stay, they applaud me on my creativity on noticing this, always forgetting that they had already done so on their earlier visit.